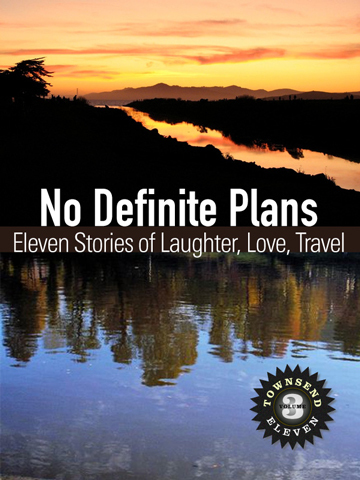 The Townsend 11 collective of award-winning writers keeps the momentum going with eleven more stories of laughter, love, travel, and imagination. The first volume, No Fixed Destination, engages readers with heartfelt memoirs and lessons learned. In the second volume, No Set Boundaries, the essays move from observation to reflection to action. The third volume, No Definite Plans, muses about routine events spun into chaos, draws wisdom from experience, and delves into novella-style fiction. Jacqueline Yau gets things rolling as she musters up strength to control the call of nature while floating downriver through Peru’s Amazon jungle. Barbara Robertson dashes off like Speed Racer in an animated day-in-a-life ride through California airports, press meetings, and a series of blunders. A surprise, free-spirited spectacle in a cathedral in France turns heads and gets Bill Zarchy thinking about paradise lost. The contemplation continues with Jennifer Baljko wondering about the primal need for women to bond while at a bathhouse in Morocco. Dana Hill paints a tapestry of Midwestern scenes and sentimentalities that will resonate with anyone who has returned home. Carol Beddo considers the impact Ethiopia’s emperor will have on her personal life. John Dalton and Larry Habegger unlock more mysteries by peeling back the emotional complexity of the after-trip effect and the inevitable passing of time, two themes which reflect back on all of us. Marking Townsend 11′s debut into fiction, Bonnie Smetts and Y.J. Zhu introduce Dr. Sarin, a doctor in India, and Li An, a widow in China, compelling characters who seek comfort, joy, and a new lease on life, while Jacqueline Collins narrates a modern fable showing the power language has to connect or disconnect people across generations. If you like the adventures published in Travelers’ Tales, Lonely Planet, and other creative anthologies, you’ll enjoy this bundle of thought-provoking stories. Townsend 11 aims to delight, entertain, amuse, and inspire readers of all ages. No Kindle? You don’t have to own an e-reader like a Kindle, iPad, Nook or other tablet to enjoy our e-books. You can probably read them on a device you already own.